This ship was built by Alex Stephen & Sons, of Glasgow, as the Wilson's & Furness-Leyland Line's Winfreda. She made her maiden voyage, from London to New York, on 3 March 1898, and her last voyage for her original owners in June 1898, on the same route. She as then acquired, with her sisters (Alexandra/Menominee, Boadicea/Marquette, Cleopatra/Mohegan and Victoria/Manitou) by Atlantic Transport and was placed on ATL's London-New York service. She made her first two roundtrips for ATL under her original name, and was then renamed Mesaba. 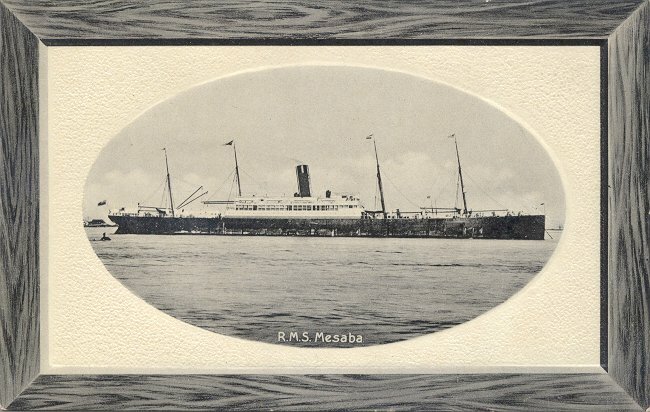 In 1909, when Minnewaska III entered service, Mesaba became a reserve steamer. She also made three Antwerp-Boston-Philadelphia sailings for the Red Star Line between 1912 and 1914, before returning to ATL service in June 1915. On 1 September 1918, while Mesaba was 21 miles from Tuskar Rock, making a convoy voyage from Liverpool to Philadelphia in ballast, she was torpedoed and sunk by UB 118. There were 20 fatalities, including the ship's commander. Sources: Bonsor's North Atlantic Seaway; Haws' Merchant Fleets in Profile; Williams' Wartime Disasters at Sea.